OK...you keep freakin me out...is the pink lemonade cake a southern cali thing? was he raised in So. Ca? My Mom made us a traditional pink lemonade cake but it had cake in between, not the graham cracker topping...weird...but it is the BEST cake ever!! Tell your hubby happy birthday and we all owe him cake because he serves our country! Hey you can't show us that pic and tell that story and NOT GIVE US THE RECEIPE??? Please!!! YUMMY! Happy Birthday to him! Last year's post is HYSTERICAL!!! (and rather touching too). Glad you are all together to celebrate this year. Glad you were all able to celebrate together this year too! I'm going to tuck the make-everything-you-hate-for-your-birthday-when-your-away idea for future use. Is that too many hyphens? LOL, I agree with Deb. You can't show us the cake and tell us the incredibly funny, and sweet story without giving us the recipe. Oh dear!! I must have this recipe - pretty please - LOL!!! oh i totally remember last year's "make everything g.i. joe husband hated" birthday. and now he's the cow whisperer!!! We do that recipe a lot and it never occured to me to change the concentrate. I don't know if my hubby would be as open as yours was. Yum...that looks good. Do you share your recipe? That was a cute idea for last years birthday. That cake actually sounds fantastic! It does crack me up that he never thought to switch it up, though. So funny. 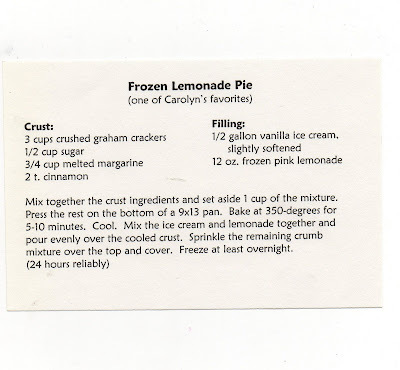 If you feel so inclined to divulge the secret family (altered) recipe, I would love to know how you make it. Happy Birthday Jake! Hope you have an amazing day! V, I will call you soon.. I just finished a really good book. You just might like it..
Oh ya, thanks for the link to the mosaic maker. I love my new header.. I also love yours. Happy Birthday to your husband. The cake looks yummy! Is it hard to make? Happy Birthday to Mr. V and Co.
That cake sound delicious. Thank you for sharing the recipe. 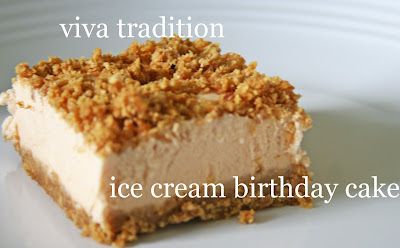 Perfect weather for icecream cake. I like that you do it like a sheet cake. I've done this before, but as a pie, and we put raspberries on top. Do you ever just pinch yourself and realize he's home? Happy birthday J! p.s. thanks for the recipe. The anti-birthday from last year is a really, really good idea. Clever! Checked out your post from his B-Day last year. So funny! Glad he's with you this year, and thanks for the recipe! My mother in law always makes that dessert with Hawaiian Punch concentrate. The apple raspberry sounds yummy. I will have to tell her! Well I'm not an ice cream fan, but I think I would love that! not only are you super talented, but you are freakin hilarious too! That's what keeps me coming back! and yes i'm from southern cal and so is he. Sounds like you had a yummy b-day celebration! Thanks for sharing the recipe. Happy Birthday Jake! That was a great story! It is amazing what we still have to learn about our spouses! It's just the simplest things... who wodda thought? My family makes this with a small can of orange juice. the freaking best. Try it you will love it, especially on a hot summer day. Hi V, it's been a while, I'm trying to catch up on your blog! I love it! Thanks for sharing your humor and talents! I love you! This is an in-law family favorite! We did a twist on the crust and have used butter and Keebler Sandie - it's delish!!! Made this last night and I LOVE it!! Thank you for posting your recipe.